Hi again! Welcome to Day Three of Dutch Oven Week! 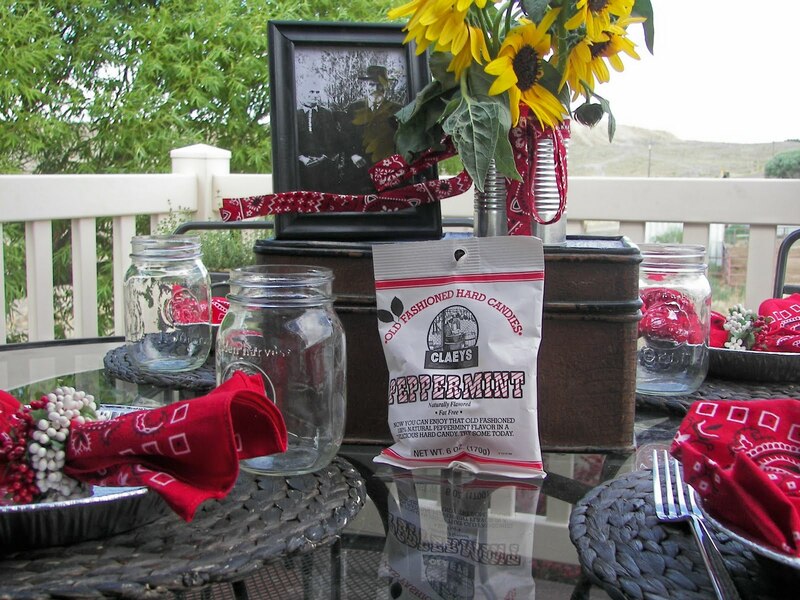 Today I have set a "Pioneer Tablescape" to honor the Pioneers who crossed the plains. I have several ancestors who crossed the plains to get to Utah. Many of my ancestors first left Europe and then crossed the plains to come to Utah. To be considered an official "Pioneer," you must have crossed the plains before 1869, the advent of the transcontinental railroad. Many of these pioneers would have used Dutch Ovens for cooking as they crossed the plains. Welcome to Tablescape Thursday's 100th Anniversary! Congratulations Susan! Also welcome to Alphabet Soup Week at Jenny Matlock's. The man in the picture is Moroni Savage and his wife Charity (Kinder) and they are my great, great grandparents. When Moroni was three years old, his parents, Henry and Sarah Power Savage emigrated to America in 1854 from Liverpool, England on March 12, 1854 and arrived in New Orleans on May 2, 1854. This tablesetting is about as simple as it gets! 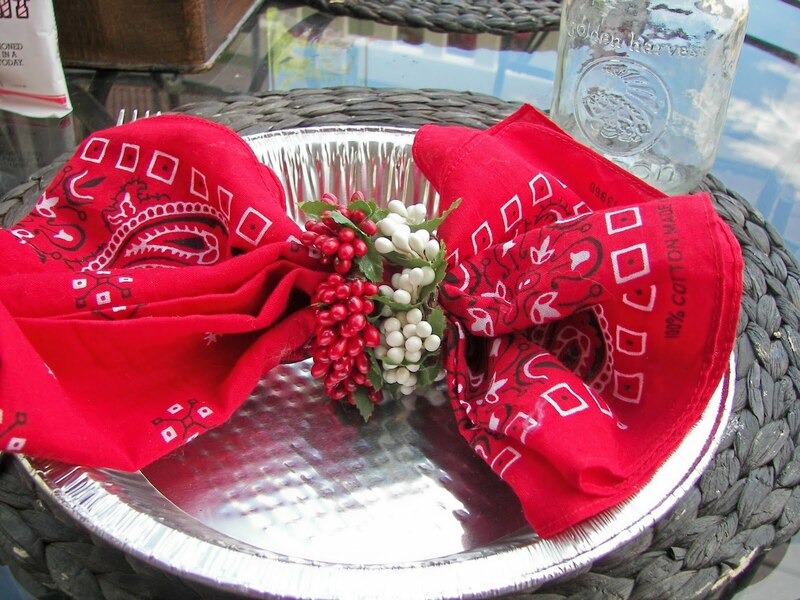 Tin pie pans, bandanas, and Mason jars! When they embarked at New Orleans cholera had broken out on board and they were taken to Quarantine Island in the Mississippi. Moroni's eldest brother John, along with hundreds of other immigrants died of cholera that year. After the quarantine was raised their family sailed up the Mississippi and Missouri rivers to the vicinity of Florence Nebraska, where they were outfitted to cross the plains. Moroni's family didn't bring Mason jar with them as they were first manufactured in 1858; but Mason jars were one of the first jars used for canning. Glass was a huge improvement over cans that might give you lead poisoning. They make great glasses don't you think? We drank out of them for dinner and I liked using them. Moroni's father Henry had sent money ahead to buy his outfit, but was sadly disappointed to find out that what had been procured for him were two yoke of unbroken Texan steers with wide spreading horns; they were wholly unfit for a journey across the plains. In Wyoming, the cattle gave out and the captain of the wagon train distributed the family's goods around others in the outfit and left the wagon and many of their household goods on the wayside. Do you think they had to leave any of their Dutch Ovens. Maybe so because they are so heavy! I set some old-fashioned candy on the table. 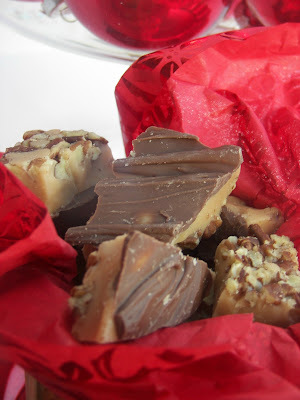 I have read Pioneer accounts on how special candy or cookies were. Sweet goods were almost nonexistant for the Pioneers. They arrived in the Salt Lake Valley on October 6, 1854, after about a seven month journey. That evening Moroni's baby sister Rachel was born. Henry's parent's lost a child and gained a child on this journey. When they arrived in the valley, they were really hindered by the loss of their cattle, wagon, and many of their household goods. 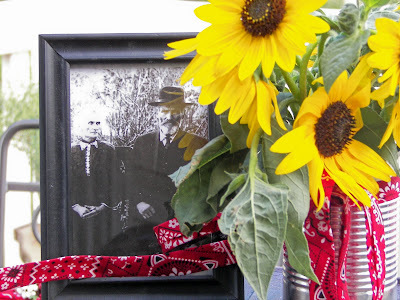 I used a tin can for the sunflowers which grow wild in my back yard. If I tried to grow them, they wouldn't grow! Thank you for joining me for Dutch Oven Week! I have enjoyed being able to tell you the Pioneer story of my great, great grandfather Moroni Savage. I am posting this with Susan at Tablescape Thursday where you will be inspired to set a better table. 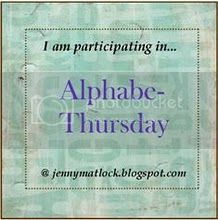 I am also posting this with Jenny Matlock's Alphabe-Thursday where the letter of the week is "Alphabet Soup." I'm on my way to SLC for a family reunion-always on the 24th! Love the story of your pioneer family, it reminds me so much of mine. thanks for sharing with us. 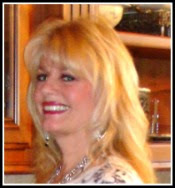 Really nice post Joni, you are always so creative, you must have been a professional writer when you lived in CA! I loved the history and the sunflowers and candy. 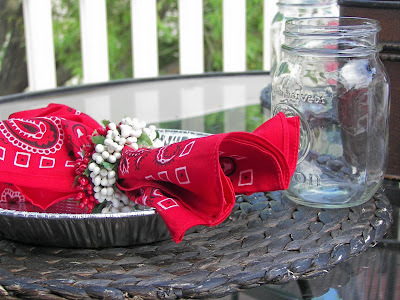 Those napkin rings really add pop to a table I have noticed. This week got crazy, maybe next we will come say hi. Thanks for stopping by my blog. I have enjoyed my visit here - aren't you lucky to know the story of your pioneer family. I know the names of mine, but I wish I knew the details! Your table is perfect - bandanas and all. 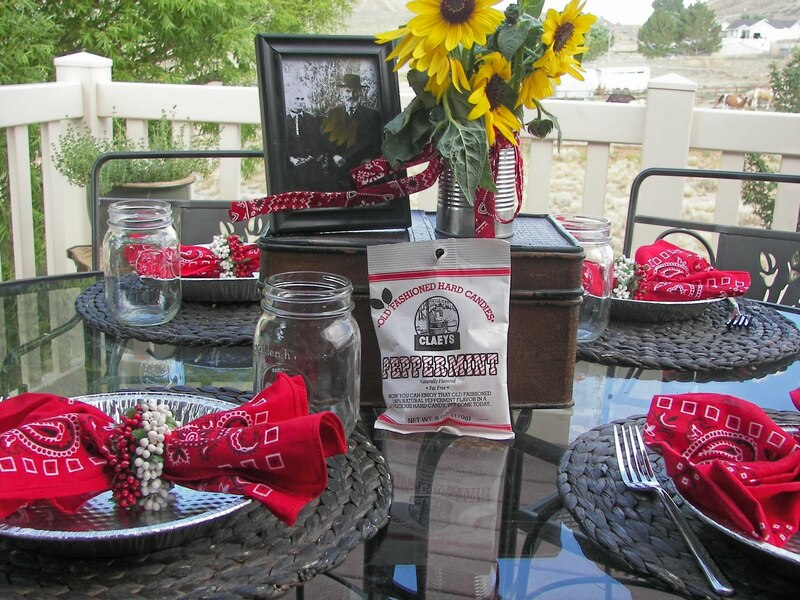 Love your pioneer tablescape! I cannot imagine how hard things must have been, but they did it. Lovely post!! I hope you'll write more about your interesting ancestors - what courage they all had! What charm it has! And red is my favorite color! Great fun reading posts like yours on Thursdays and learning about other bloggers' ancestors!Love to hear more...! PS Mine this time is HERE. Hope you've the time to join me! Family history fascinates me, others as well as my own. What incredable sacrifies your ancesters must have had to make to get to where they were going. There were no pioneers in my family. My great grandparents made their way from Sweden to New York and settled there. They were craftsmen who found work in the city and did not feel the need to travel farther. And then I decided to go back, where the other side of my family lived. Fun to visit with you here! What a lovely written post, Joni! Wonderful post and table, Joni! Joni! 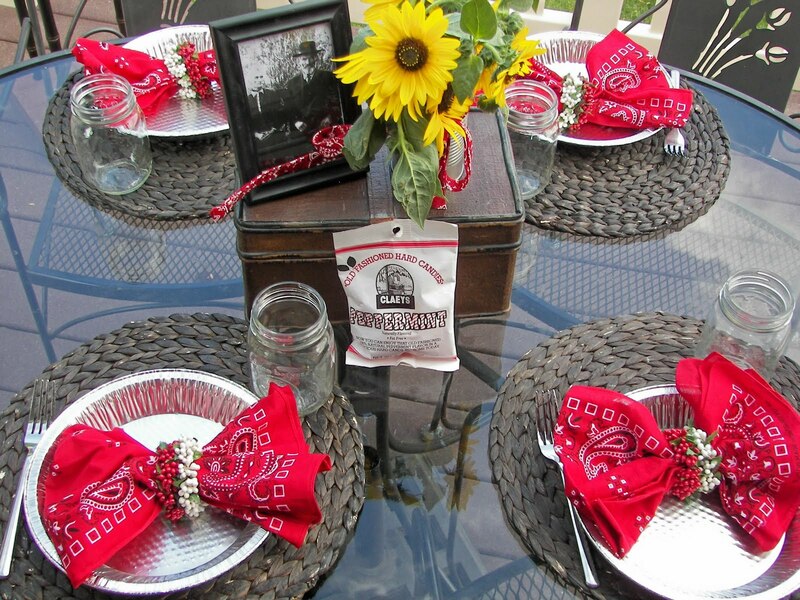 This is so fabulous..I love that you are sharing your family history through a tablescape! I love to hear aobut pioneer stories and you do it with flair. This gives me an idea for an enrichment activity! FHE How to teach your children about pinoneer heritage at the dinner table ...what do you think? We are going to be doing a whole evening on FHE ideas and this could be such a fun and fabulous idea. It is visual (bandanas, tin plates, photos of ancestors etc...), informative (even if they don't have personal heritage one could still teach about it) , interactive (eating and using things they may have used) and "sweet" (candy) Awesome idea!! I just love the simplicity of your table setting. How cute using pie pans for plates and the mason jars for glasses. I enjoyed reading the history, too. This was so interesting about your family history. How neat that you have this knowledge of your heritage. I liked the tablescape very much. Simple for a simple time. Great post. What a fascinating story! Your table really pays tribute to your pioneer ancestors. Love the authenticity! Great story, very interesting and a nice tribute to your kin! Those potatoes look very delicious! Joni, what an amazing story you told us. It was very interesting for me because I did a lot of research about German people who emigrated at the early time to USA. Today we can read online the ancient passagier lists of the ships who left Hamburg. So your story completes the informations I have got during my reserch. What a hard life they had. And also it was very interesting to learn about the Dutch Ovens. I have never heard about that before. But sounds really like a clever and energysaving system of cooking. Your table is a pretty tribute to your ancestors. I love this idea. I made a very simple table today, too. It is a farmers vesper as my ancestors had done it probably, too. Thank you for sharing you touching story. I loved the story, you are blessed to know such history of your family. Don't you wonder why in all those old time photos the people look so serious and almost angry? My family photos are the same...maybe the clothes were uncomfortable, or they were hot? I think your table setting is perfect for your theme this week. I enjoyed hearing about the history of your family. How wonderful you know of it. I enjoyed your simple theme for your tablescape. I especially like the wildflowers in the can. You hit on my favorite things. I love sunflowers and all things pioneer so I love this! This was fascinating to read! When I traveled West i had a greater appreciation for what the pioneer must have gone through to settle those lands. 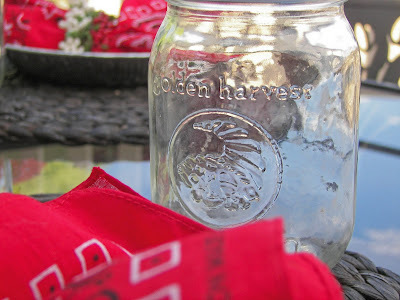 I love mason jars and use them for all sorts of things...they are so versatile! Thank you for sharing this wonderful family story with us. And your table is really lovely and gives me some great ideas! My ancestors were Oregon Pioneers, traveling by covered wagon from Missouri to Oregon in 1852. A great post with pioneer day coming up! What a wonderful idea. I love how imaginative this scape is. Love the red bandannas and jars to drink from! It is wonderful you know so much about your distant relatives. I know practically nothing about mine. Fun table scape! This is one of the most unique and darling tablescapes I've seen! I'm going to have to copy it one day for my girl scout troop when we learn about those days. Great job! 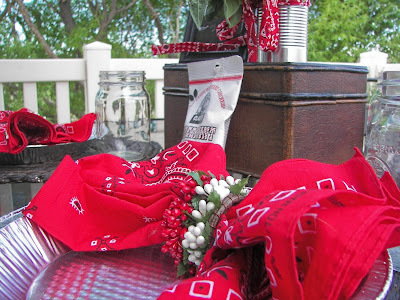 I enjoyed the family history that went along with the table setting. Very nicely done. What a fun and adorable table!! Love the red bandanas and the pie plates..so clever! Your sunflower centerpiece is so cute and pretty! Love it all..great idea! how wonderful it is to know so much about your family history! totally enjoyable post! What a beautiful, bright and happy table to serve our Alphabet Soup from! And such a fascinating family history. It's wonderful that you have so much knowledge. Have you written a book about this? Thank you for this cheery link! I am always happy to "C" you on this meme! How awesome is your table! Love it! Joni, This is an adorable tablescape. It's very creative! Hey, I noticed this on your webpage: "This image or video has been moved or deleted. photobucket." Be sure to go to The Cutest Blog on the Block's website and it will tell you what to do....otherwise, you will lose your blog's background. I had this happen to me with scrappin' blogs recently. If you're interested in "why" this is happening go to scrappin' blogs site and read the first paragraph. You CAN fix it though - go to TCBOTB website and follow their instructions. If you need help, e-mail me, Joni. Good luck. This is a great table...love your "dishes"! Everything is so cute with your theme. Thanks too for a history lesson! Thanks for sharing. Stunning! I love it! Very educational, entertaining and visually beautiful. Thanks for sharing. What a charming table and story of your ancestors. Love the pie tin dishes and mason jars! 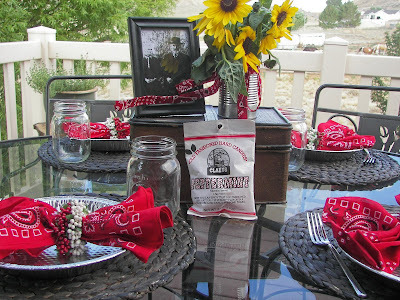 What a wonderful way of honoring your ancesters through your tablescape -- thanks for a wonderful story to go along with your charming tablesetting.